Write the nutritive value of cow's milk? Pasteurization is heating of milk to such temperatures and for such time period which is sufficient to destroy pathogens present in milk but leads to minimal change in the composition, flavor, and nutritive value of the milk (WHO). Enumerate three methods of pasteurization. 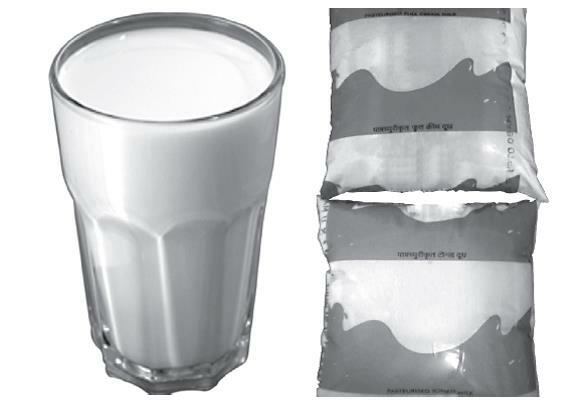 Enumerate tests of pasteurized milk. Comment on the types of proteins present in milk. •	Milk proteins are complete, i.e., they contain all the essential amino acids. •	The main protein in milk is casein. •	This is present in combination with calcium as calcium caseinogenate. •	Other milk proteins are lactalbumin and lac- toglobulin. •	Human milk proteins have higher amounts of tryptophan as compared to animal milk. •	The net protein utilization (NPU) of milk protein is 75. Comment on the types of fat present in milk. •	Fat content varies from 3.4 g% (human milk) to 8.8 g% (buffalo milk). •	Milk fat is present in the form of fine particles and hence easily digestible. •	Milk fat is rich in vitamins A and D.
Why is milk called an ideal food? •	Milk is a good source of proteins, fats, sugars, vitamins, and minerals. •	Proteins of milk contain all the essential amino acids. •	Milk fats are rich in vitamins A and D.
•	Minerals—calcium, phosphorus, sodium, potassium, magnesium, cobalt, copper, iodine, etc. •	Vitamins—milk is a source of all vitamins except vitamin C.
•	It is available to the baby at the correct temperature. •	It fully meets the nutritional requirements of the infant for the initial 4-6 months of life. •	It is easily digestible for the baby. •	It contains antimicrobial factors such as macrophages, IgA, antistreptococcal factor, lysozyme, and lactoferrin. •	It promotes "bonding” between the infant and the mother. What are the main differences between cow's milk and human milk? •	Refer to Table above. •	Human milk protein contains higher amounts of tryptophan and sulphur-containing amino acids. It is a blend of natural milk and reconstituted milk in fixed proportions. Its composition is similar to that of cow's milk.